"It's more complicated than I'd thought, you know"
Mr Monkey went up to the first floor and paid to get into the museum part of the centre. 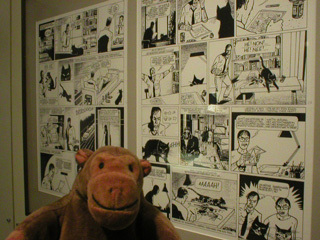 This first section of the display shows how a comic strip gets from someone's imagination, through the drawing, colouring, lettering, and printing, to the shop. 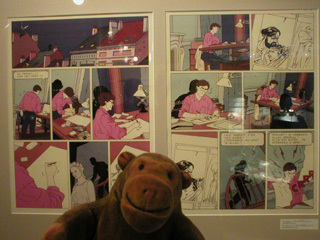 Mr Monkey liked the way this was all portrayed in comic strips, even if they were in French and Dutch. Read all about the CBBD at the CBBD website.